Hi everyone :) Hows it all going? Hope all you QLDers are surviving all the rain :O Its crazy the amount of rain we have had! 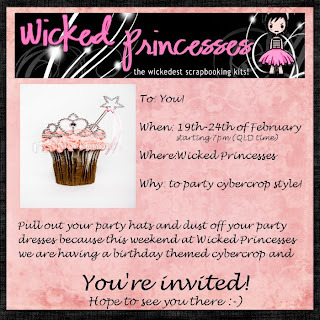 Yay!Its time for another cybercrop at Wicked and all the fun kicks off at 7pm QLD time on Friday night, there will be games,challenges,fun and lots of chances to win a prize or 2 :)Hope you can join in! OK, Ponky the kitten will have to do as scrap object so I can scrap with pink. Or RL Scoobie - she is quite feminin and a real blond bombe. Did I tell you lately I love your flowers? Your work is always beautiful and inspirational. Love those flowers you have created. 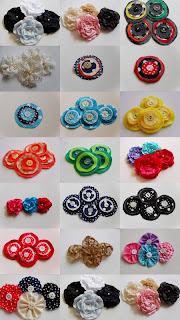 I will have to dig out a ribbon flower book I have somewhere in my embroidery stash and make some of my own for my wedding album that after 16 years I am feeling brave enough to tackle LOL. Will have to share some ideas with you too. The LO of you & Al is totally gorgeous! Lovely, lovely, lovely! And I agree with Kate, your Josh LOs rock - no need for any improvement! You are a busy girl! Gorgeous work with the layouts :).